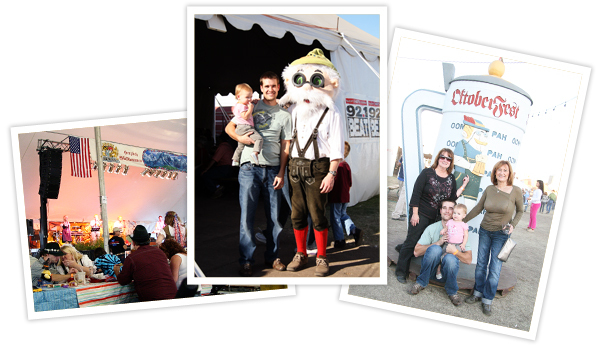 As I've mentioned, Oktoberfest was this past weekend here in T-town. The plan was to save money by going during the free-admission time and not eating anything while we were there because we had a German feast to come home to. Such was the plan anyway. We made it inside the gates with seconds, and I mean seconds, to spare. We didn't plan on the traffic and had to run for the gates. Sweet P and I made it through, then Eric and then the ticket-takers started moving out saying time was up and everyone needed a ticket. My mom held her phone up with the time showing there was still one minute to go as she pushed on through. They ended up letting her through - along with a drove of others! It was a fun start to the event. 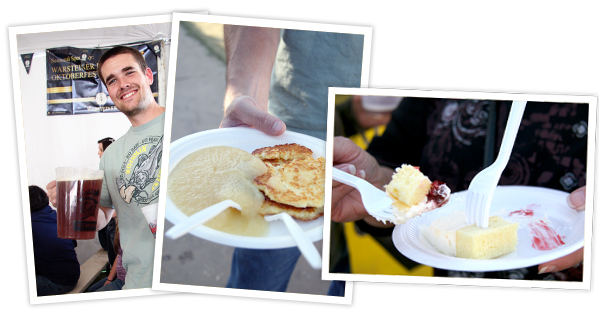 We walked from tent to tent, hearing various sounds of music and cheering and smelling all kinds of tempting treats. We hadn't been there 20 minutes before the beer (the husband's beverage), potato pancake and Ludgar's Bavarian cream cheese cake had been purchased. With full bellies it was time to work a little of those calories off with a little chicken dancing. Sweet P once again wooed the crowds and had everyone around her clapping and smiling. It was a good time. I think I need one of those German hats for me and Sweet P next year. First up, the Wiener Schnitzel and German potato salad. 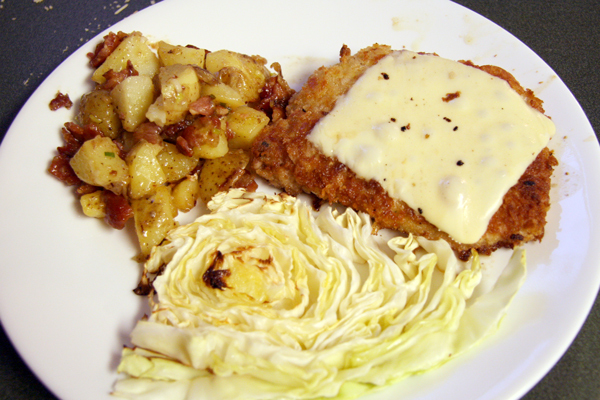 I tried this chicken schnitzel recipe but used tenderized-boneless pork chops for the meat. The husband said it was the best schnitzel he's ever eaten and that it reminded him of the one he would order as a kid at Ursula's (Tulsa restaurant no longer in business). I thought it turned out pretty good. 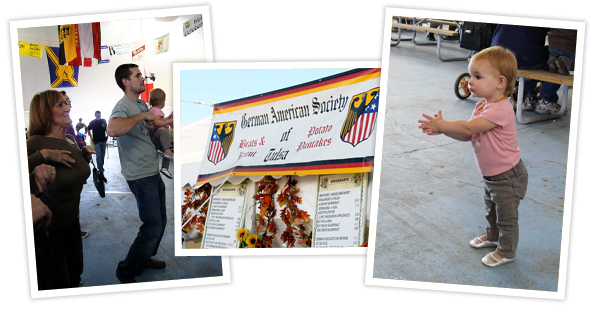 Then there's the German potato salad recipe that I mentioned last week. Again, the husband loved it and said it was the best potato salad I've ever made. Personally, I prefer a cold, smashed potato salad but it went well with the dinner. 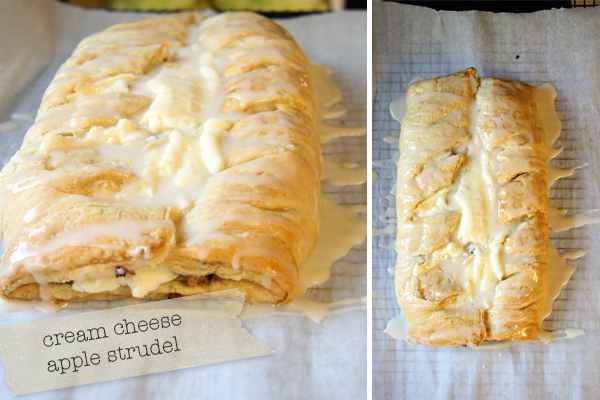 Next up is the recipe for apple strudel I also mentioned last week. After I converted everything in her recipe, I decided to use puff pastry instead of phyllo dough. I like puff pastry, it's easy and I'll use the leftovers. Plus, I didn't feel like taking the time to do the whole buttering the 4-5 layers or phyllo. I'm lazy. The puff pastry ended up working out really well and the strudel was amazing. Really folks, delicious. 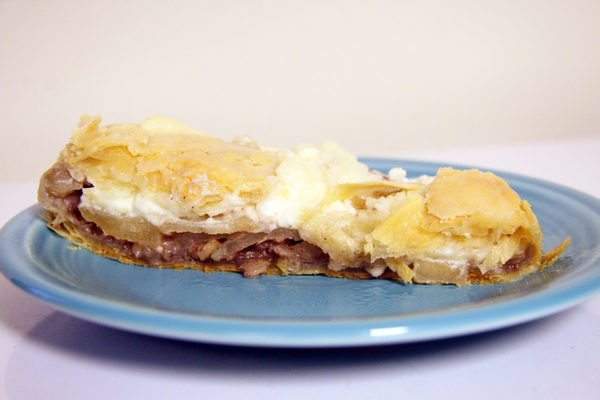 I used honeycrisp apples inside and topped the strudel with some icing to really take it over the edge in the healthy department. 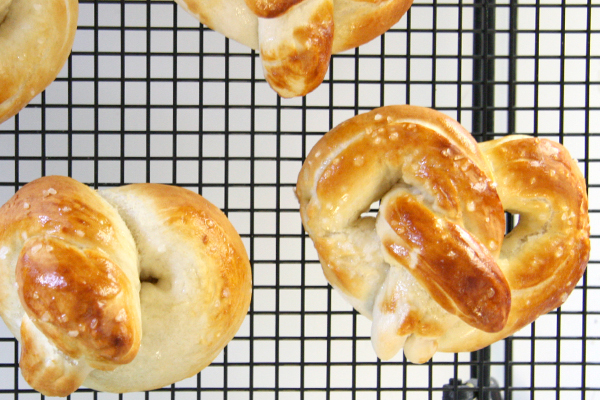 And, last up, I tried this recipe for homemade pretzels. They were a huge hit. I read a lot of the comments on the recipe and ended up going with 4 cups of flour and using my kitchenaid with the hook attachment to knead the dough. That thing made this recipe SO easy. The pretzels smelled amazing and were perfect right out of the oven. The recipe calls for sugar but the husband didn't care for the sweetness of the dough. I didn't mind but will probably use less next time I make them. They were also really good covered sprinkled with cinnamon and sugar and coated with melted butter. Such a great treat. After all the German food cooking and eating I have determined that the German folk aren't too concerned with calories and I'm happy Oktoberfest only rolls around once a year. Seriously how do you two stay so skinny with your food addictions! All of that looks amazing. Can I babysit Sweet P and you cook for my family? Or just me? When you have two littles at home you will probably take me up on that offer!